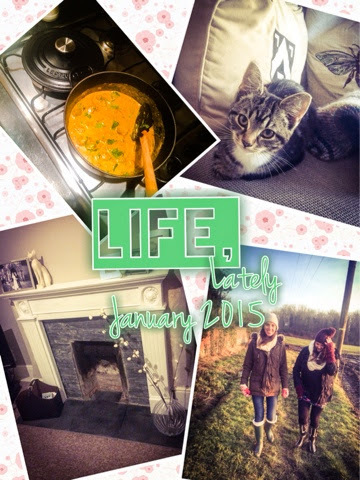 I can’t believe we're almost done with January, that most horrid of months! How have you been coping with it? Even though my break over Christmas recharged me somewhat, I am struggling with feeling generally demotivated and less than enthusiastic about pretty much everything at the moment. Perhaps I need a new challenge? 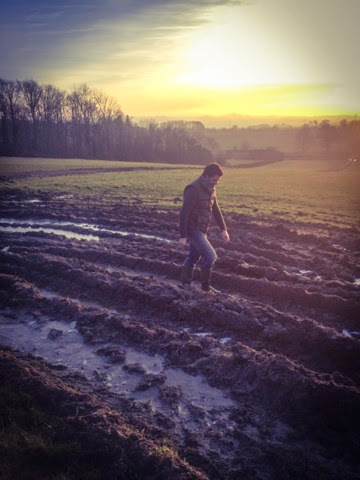 Work and gym and everything feels a bit too routine at the moment and I've lost my spark in a really generalised way that's hard to pinpoint - even blogging has felt a bit like a chore at the moment. We’ve been getting more settled into the new house and started tackling some of the decorating, and we’ve made good progress, although there’s still a lot to do- and its dawned on me that it’s probably going to take years to get the house to the level we’d like. If you want nice quality things, they take time to amass, so although we’ve repainted the dining room and living room, set up our new furniture and hung our pictures, we’re still missing things like proper light fittings, dining chairs and nice blinds. 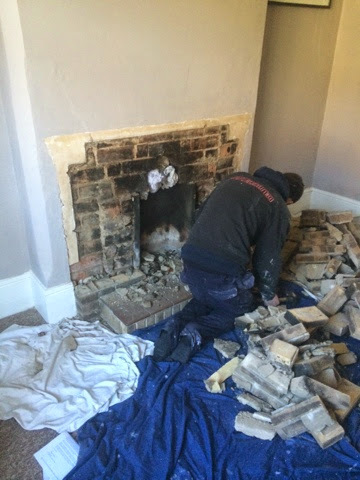 Our latest project was pulling out the horrid 80s style bare brick hearth and fireplace and installing a more classic Adams-style fitting - much more suited to our beautiful Victorian house. I was really nervous during the demolition, because even though Seb is amazing at practical stuff, we'd never done anything like it. 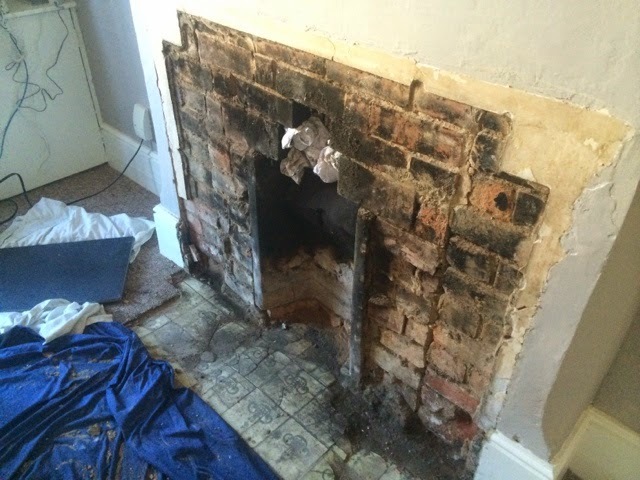 The job also involved lowering the level of the original chimney, as the brick hearth was raised several inches from floor level. This is how it looked in my living room for a while - how scary is that! 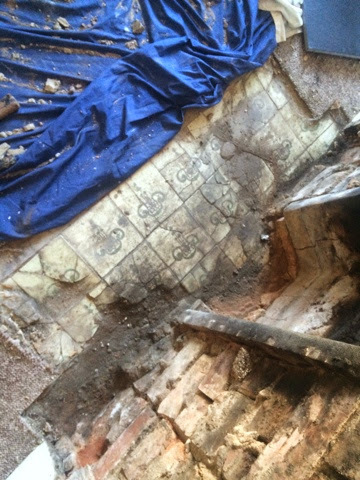 We found what I think might be Victorian tiles during the process but they were cracked and not in good enough condition to save. 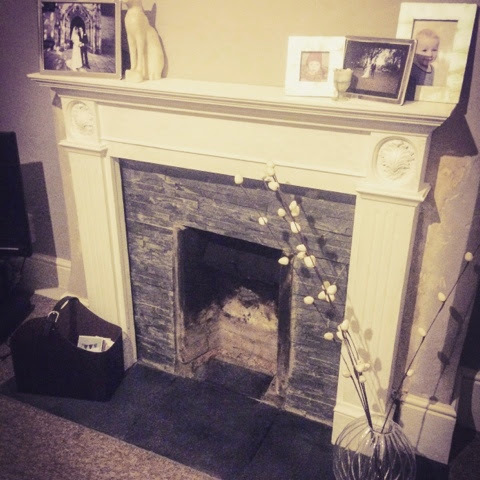 We fitted and installed a new sandstone hearth, tiled the chimney breast with split face slate tiling and painted the new mantle white to match our deep skirtings and coving. And voila! 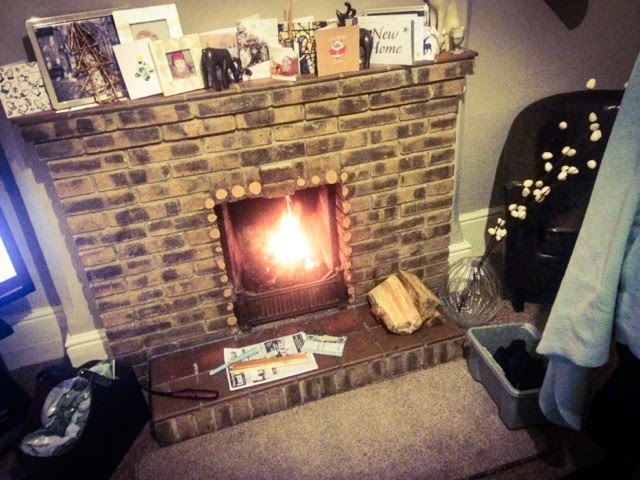 The new fireplace looks so much better and suits the room much more. The bedroom still needs work, but we did add in a new dresser above and this gorgeous new throw and cushions to the bed to make a start. 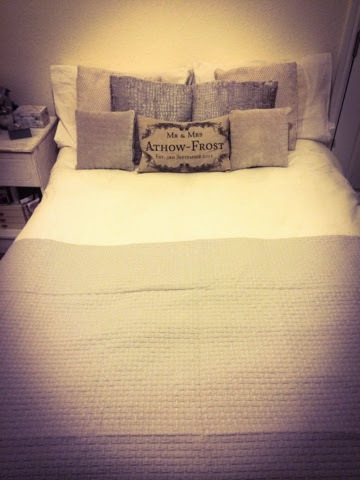 The throw is Roma from HomeSense, cushions are from Dunelm (silver velvet croc print and cream textured ones), little grey velvet ones from George, and notonthehighstreet.com for the personalised linen cushion. Its starting to come together, although its going to be a work in progress for a while. Much as I love the thrill of a new compact from Chanel or a Mac lipstick, sometimes there’s nothing like bagging an absolute bargain to make your day. 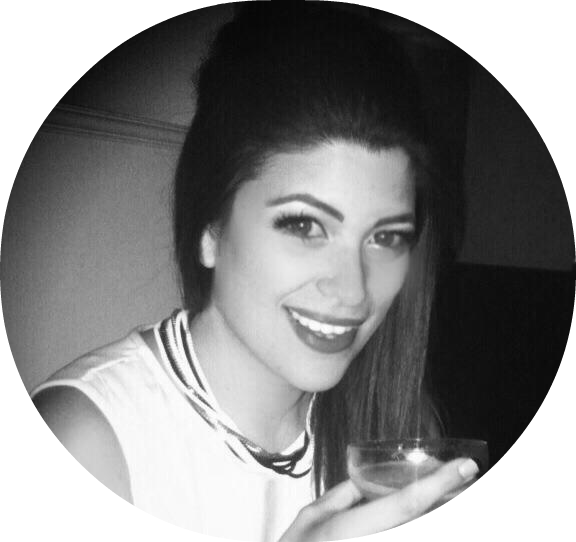 I popped into the poundshop recently to pick up some cleaning supplies, and I always take a look at the beauty aisle while I’m there – I’ve found products from Stila, Urban Decay and Calvin Klein in there before, so of course I have to look. 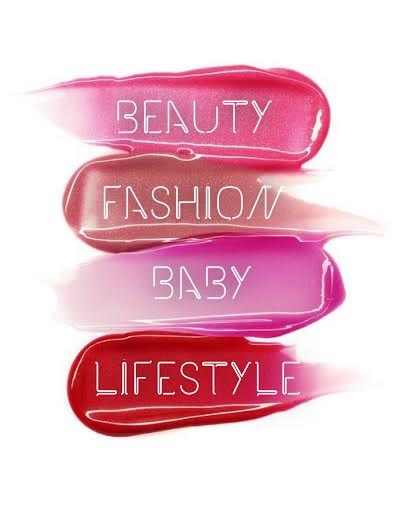 Maybelline Baby Lips – like most girls, I’m obsessed with these colourful, cute little balms especially during the winter months. 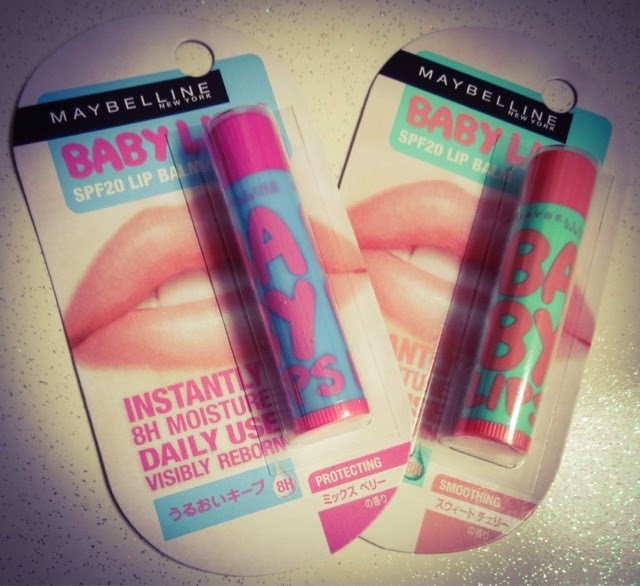 These are different to the usual Baby Lips – I think they may be from Japan judging by the packaging, and they’re not tinted. But they do smell yummy and do a great job of moisturising like you’d expect! 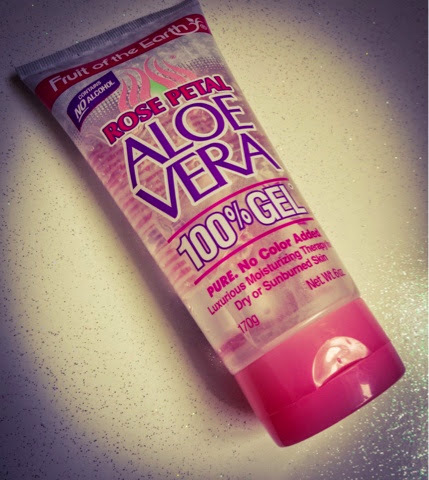 Fruit of the Earth Aloe Vera Rose Petal Gel – I swear by Aloe Vera if you have irritated, itchy, dry skin, it does a fantastic job of soothing. I also love things with rose in or that are rose-scented, so when I saw this big tube of gel, it went straight in the basket. I’m hoping it will help to keep my dry winter skin in order. 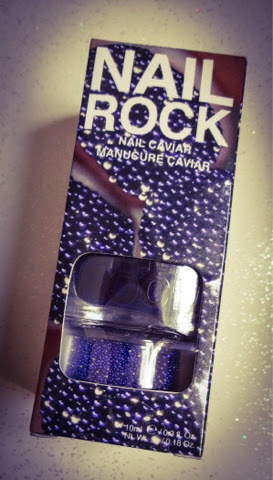 Nail Rock Nail Caviar kit – The nail products section seemed to be full of interesting stuff this time, and one of the items was this caviar manicure kit, where you coat your nails in 3d beads. I’ve always wanted to try this, but the kits can be hard to come by, so as soon as I saw this one, I pounced. I love the dark navy and black mix of colours in this kit - you get a base colour polish and a dish of the little beads. These kits are currently sold in Topshop for around £6.99. Its not the most practical thing, but the effect would be stunning for a night out or a big occasion. 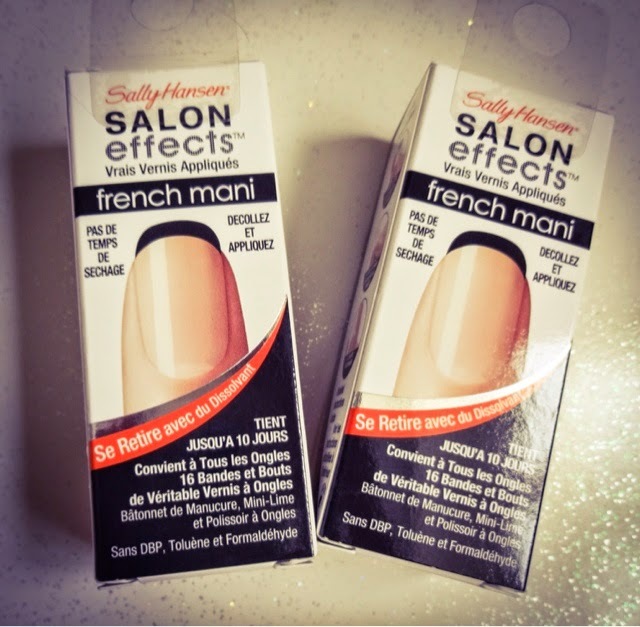 Sally Hansen Salon Effects French Mani - if there’s one look I always love, it’s the French Manicure but with black or bright coloured tips. I’m pretty basic with nail art and I hate drying time, so it’s the one thing I’ll usually attempt, but getting a decent line can be hard. These tip strips seem designed to make that easy. They come in a range of colours including glitter and things, but the black was so perfect, I picked up two boxes. So maybe I can finally get cute nails in between salon visits! 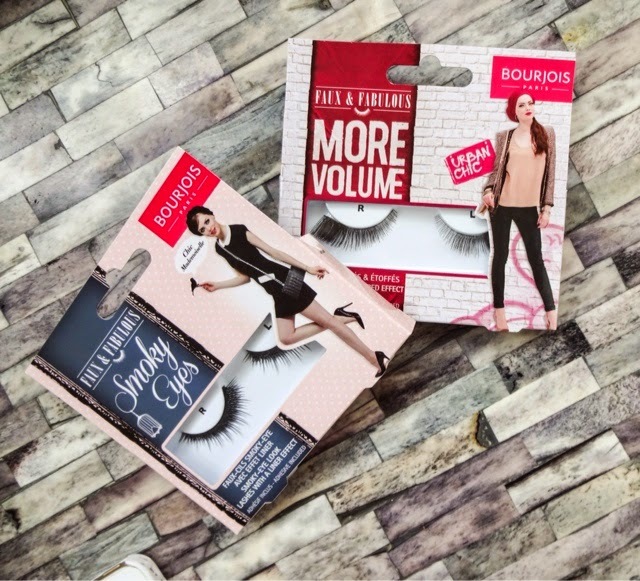 Bourjois Faux & Fabuous Lashes - as a lash addict, I pounced on these when I saw them. I haven't tried Bourjois' offering on the lash front before, so it seemed like a great opportunity to give them a go. There's a style for smokey eyes, which look really soft and fluttery, and a volumised style. I liked that they aren't too OTT and they look as if they'll give a really nice effect on. Walking sounds like a pretty boring hobby, doesn't it? And yet I must be getting old, because its become one of my main pleasures. If I don't get my Saturday walk in now, I feel all cooped up and restless. 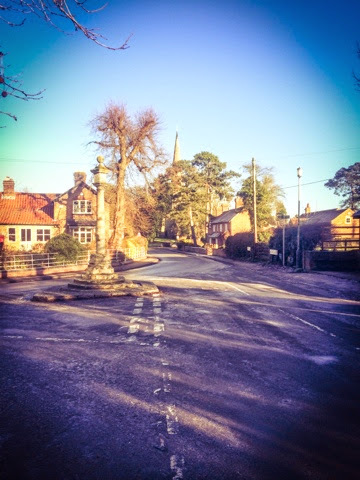 Its so good for the mind, and lovely to get out there and see a bit of your neighbourhood, or some countryside scenery. Definitely an underrated past time in my book! 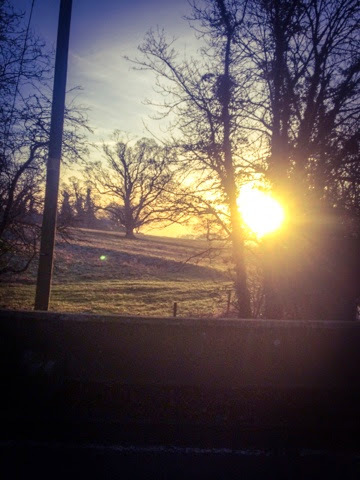 With all the cold but gorgeously golden mornings at the moment, we've been out and about loads. 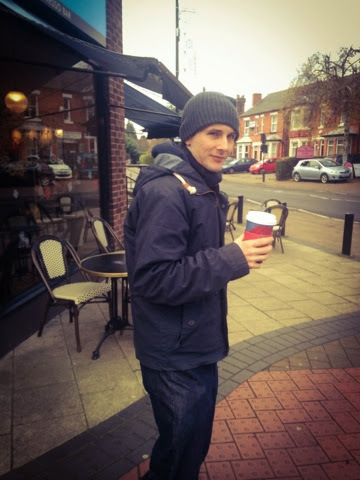 Whether its down to the town centre to grab a latte..
Or further afield in the countryside through the snow! One walk we went on was especially nice. 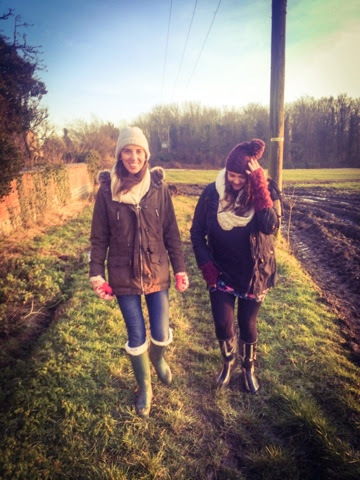 We met up with our friends Rich, Kati and Ruth and walked to a village called Colston Bassett across the fields. 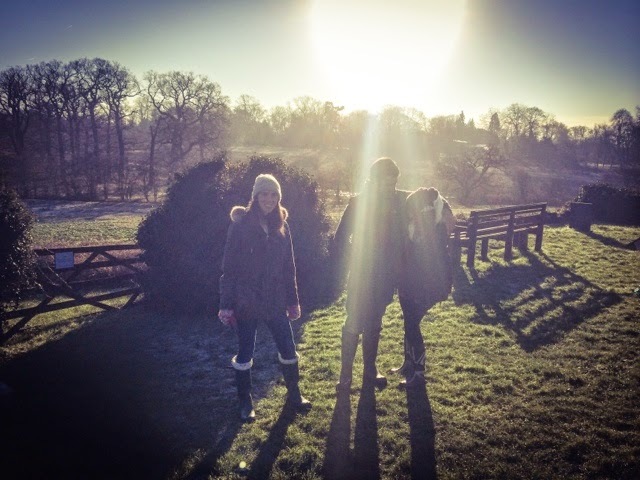 It was such a beautiful day outside, and wrapped up warm, having a laugh with friends, you hardly felt the cold. 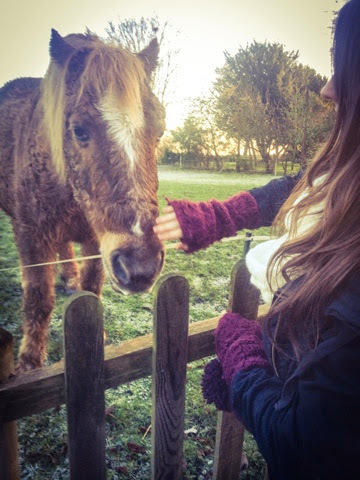 There were horses to admire and pooh sticks to play on the bridge over the stream in the village. 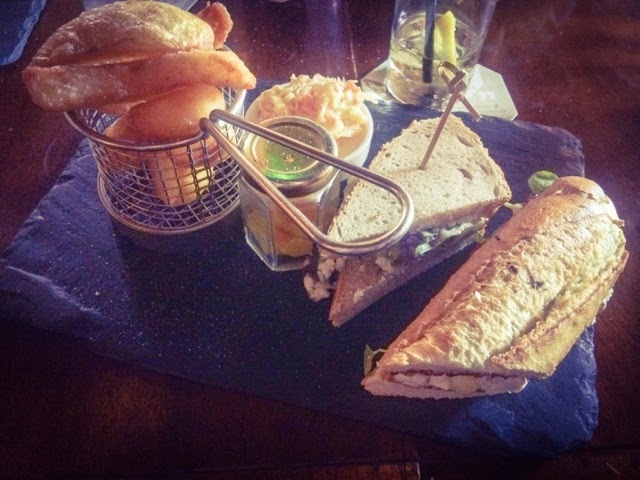 Then we decamped to the Martin Arms, which is a great little pub well known for its yummy food. I got the Stilton and Piccalili sandwich and also swapped Seb half of his Turkey, Brie and Cranberry creation! You might have a seen a few posts about the Little Black Dress Challenge, which I started a few weeks before Christmas. Normally, my shaky willpower means I’ve never been that great at diets and things, but I managed to stick to this one and I lost five pounds! I fully expect I have piled it back on over the holidays as I’m all about indulgence and excess over Christmas, but I’m considering re-starting the challenge in January to help undo the damage. It seems I’ve hit upon a combination of things that work well for me. Most noticeable for me is my waistline, which is where I carry extra pounds. I really feel leaner around that area. Very proud of myself for sticking to my plan. 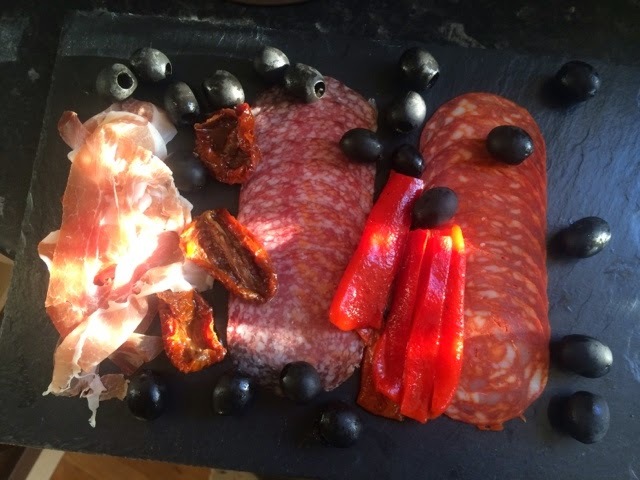 And for diet and exercise, straight onto food....well, everything in moderation! Now that we have a nice big kitchen to play in, we've been cooking a lot more, and enjoying experimenting with some new recipes. 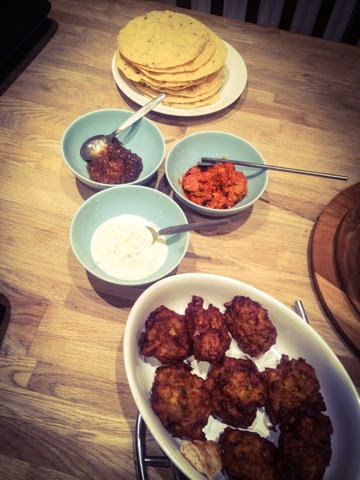 Last weekend, we decided to make things out of Rick Stein's India, which is an amazing book with some mouthwatering, colourful dishes. We loved the TV series when it was on. 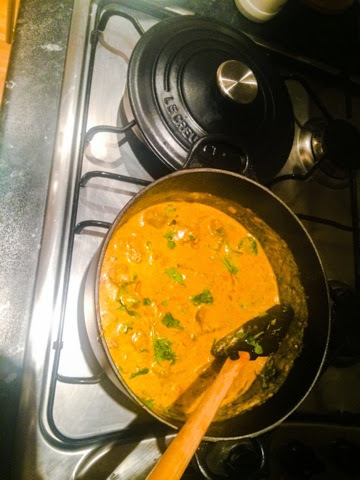 We made lamb rogan josh and it turned out so tasty! 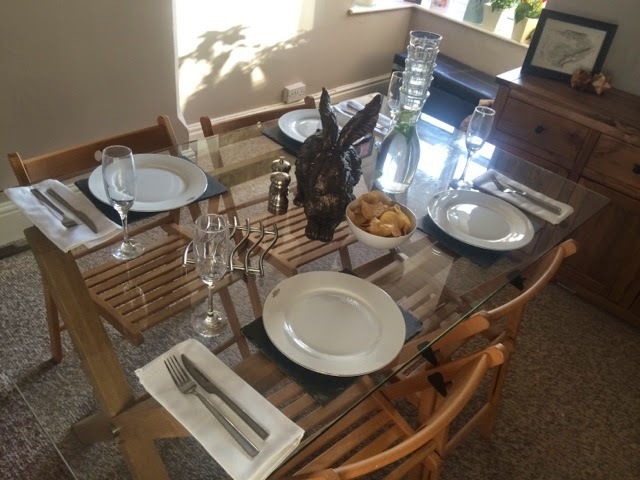 We also had some friends round for lunch and really enjoyed setting and using the new dining table. Simple things really but after working so hard and waiting so long, they mean everything to us. 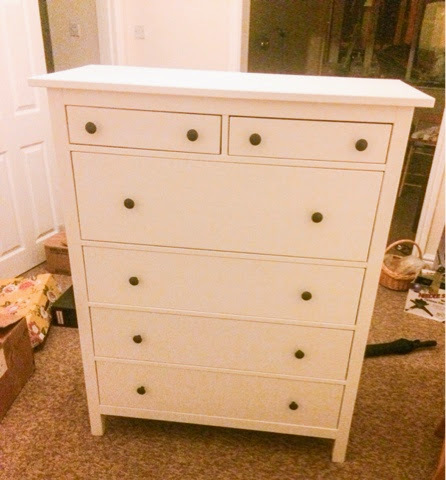 And now for something very special….we have a new member of our little family! 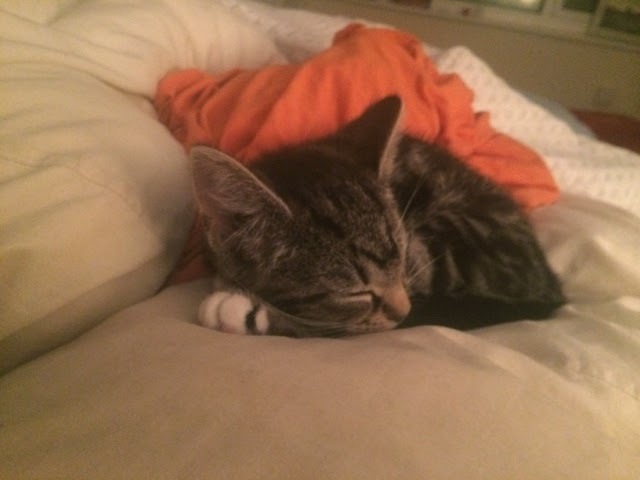 This is Shilling, our new 13 week old kitten. I mentioned her in my Christmas post, but though I'd show her off a bit more here. I’m totally a crazy cat lady at heart and both Seb and I have grown up with animals, but we haven’t had a pet for a couple of years. 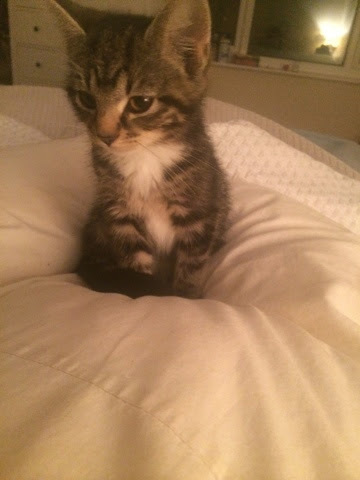 Originally, we wanted to get a cocker spaniel (still do) but we haven’t had time in the chaos of the move and decorating, to track down a reputable breeder and make the necessary arrangements, so we decided that we’d have a cat first. I started looking through the local listings weeks ago, but no one was getting back to me and I was losing hope. Then all of a sudden, a lovely lady called Louise got in contact saying she had a small litter of three tabbies – two boys and a girl. They were all gorgeous, so it was very hard to make a decision. I would have had two, but I didn’t like to leave just one behind, and I haven’t got room for all three, so we ended up agreeing to take just the little lady home. She’s settled in remarkably quickly and already completely rules the roost! 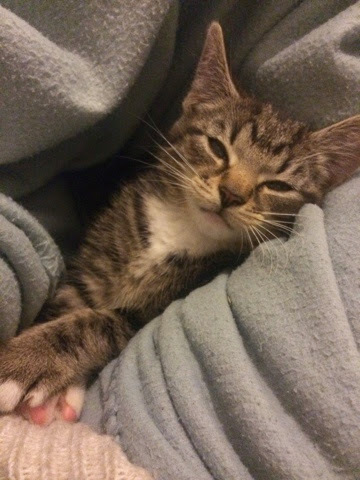 She’s very affectionate and loving, and seems to love snuggling up with us at night. She’s really made the new house a home. Congratulations on moving! I know how stressful it can be! I'm with you on the blogging getting a bit repetitive, I decided to take a break and just post every couple of weeks until I get my mojo back. Thank you Donna. We've literally been trying to 'second step' for two years now, its been a nightmare with all the bad luck in the book, I almost can't believe it finally happened!